Dealing with angry patients and their families can be extremely difficult. Many times the disability or the illness itself can leave patients anxious, demanding and angry, but health care professionals owe it to every patient and their family to provide the best of customer service no matter how difficult the challenge. Some health care providers react to anger from a patient by becoming angry themselves or by just leaving. Any customer service agent would find that behavior unacceptable. In order to defuse patient’s anger, the health provider must remain professional, empathetic and clearly communicate. It is the time to reestablish clear, calm dialogue. Listen carefully to the patient’s entire story and what is their dissatisfaction specifically. While listening repeat what they are saying for accuracy. While listening summarize what they have said for accuracy. Have empathy for the patient the entire time. Be attentive when the patient is speaking. Do not get defensive if the patient shows anger. Listen to their story and acknowledge the difficulty of the situation. 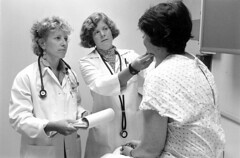 Become an advocate for the patient and refer the patient to helpful resources. Patients should feel welcome in doctor offices, and when you factor in pricing, location, ease of getting an appointment and parking, those conveniences can fill the office, but extended waiting times can quickly change the mood of the most calm disposition. At times like this, the outer office staff can mean the difference in patient anger, and the staff should not become defensive. They should be able to acknowledge the difficulty, figure out why it is happening, and express empathy for the situation. When the patient finally sees the health care professional, whether it be the nurse who takes a patient’s blood pressure, the technician who does impressions in a dental office, or the doctor who examines your heart, it should be acknowledged that a 45 minute wait time is too long, it is frustrating and a promise to see what caused the delay and a promise to take action to avoid the same inconvenience again is investigated and resolved. Are you listening medical professionals? I agree, health care is a completely different environment for “customer service”. There are so many factors that affect a patient’s response to the surroundings, such as health (they just don’t feel good), medications can affect mood and response, lack of sleep in a cold noisy room, fear of the outcome, worry about bills, concern about missing work to name a few are all factors that can impact the patient. Being patient and empathizing is the best way to diffuse an angry patient. And learning to not take it personal is critical to remaining objective and empathetic.